Foot & Ankle Center of Illinois Expanding Best Practices! MRI developers recognized these shortfalls and redesigned MRIs that were larger and more open. The industry also designed MRIs that were more modular; ones that could be installed within an exam room. An open extremity MRI is the type that was selected by Dr. Sigle. “Our Artoscan MRI is the solution we wanted for our patients. Artoscan is considered to be one of the world’s leading dedicated-extremity MR imagers that hundreds of orthopedic and radiologist groups use worldwide. The Artoscan MRI is a vast departure from the whole-body scanners. 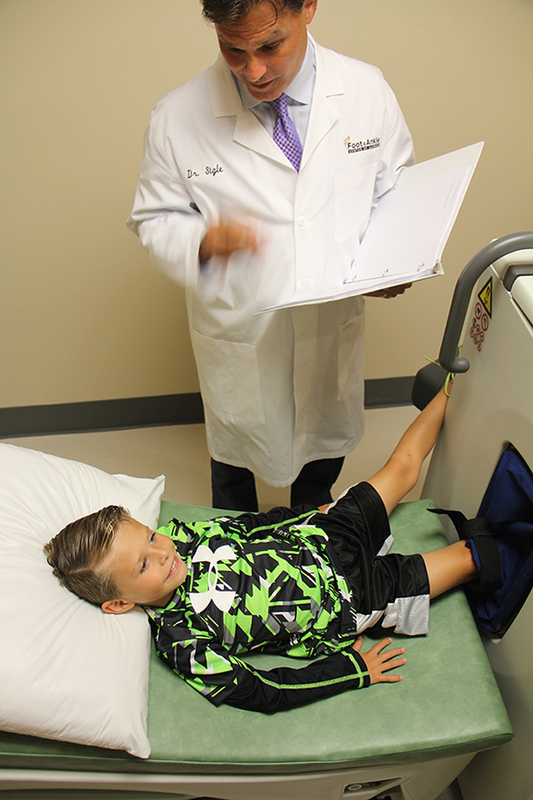 The MRI permits the patient to lie in a comfortable position outside of the machine with only the foot in the tube. This technology provides a quick and safe, non-invasive way to get images. The experience is totally different than conventional MRIs. The patient’s body is positioned on a comfortable reclining table and the extremity is positioned into the MRI opening. The other extremity is rested on support padding next to the MRI opening. The room ambience is pleasant with indirect dimmer lighting in the ceiling and a flat screen TV to view favorite programs or listen to music. A technologist is always within a few feet during the course of a scan. The sound transmission from the MRI is minimal, unlike conventional MRIs. One of major advantages of having this new technology is that patients will no longer have to schedule an MRI elsewhere that requires an added trip and delay of diagnosis and treatment. 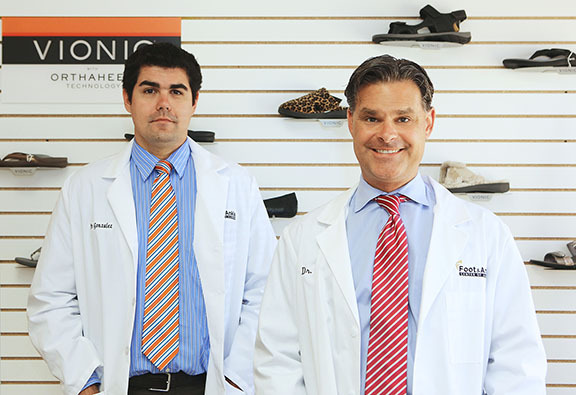 Another niche offered that differentiates the Foot & Ankle Center from other podiatry/orthopedic clinics and hospitals is its specialty products store. Traditionally, podiatrists have referred patients who needed therapeutic footwear and products elsewhere. 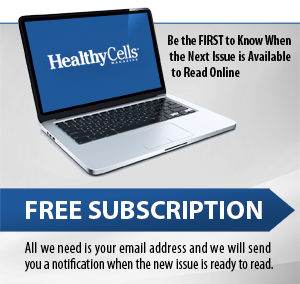 Primary care physicians and specialists are now able to channel their patients to the store because they know that it’s a reliable resource with foot and ankle products that are reliable, and ones that deliver proven results. Every product is physician recommended or has the American Podiatric Medicine Association (APMA) Seal of Acceptance. According to the APPMA website, The Seal of Approval is granted to products found to promote good foot health care and are available over the counter or by prescription only. Comfort shoes and gear for women and men to accommodate working out and running activities, shoes for work, dress, casual wear, and diabetic foot wear. Mobility assistance devices to facilitate recovery from surgery or an injury, to aid people with a chronic condition, or to enhance mobility and independent living. Knee cadies, standard crutches, canes, and other state-of-the-art crutches are available. The store is the only certified fitter in central Illinois for the I-Walk Hands Free Crutch. Accessories include shoe deodorizing and antifungal aides, a wide range of pads, topical solutions, and inserts. Shoe inserts and shoe lift inserts are available to provide support, cushions, and targeted comfort to prevent foot pain. Inserts also are used improve body alignment, improve motion control, enhance posture, and to relieve aches and pain. A wide selection of custom orthotics and custom-molded braces are also available for patients. The shoe fitters are trained to recognize a patient’s functional, therapeutic, and aesthetic needs as well. 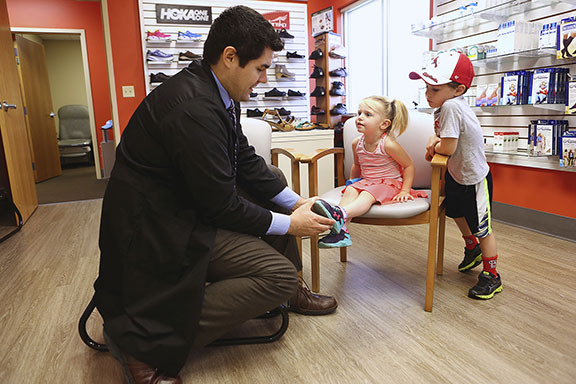 According to Dr. Sigle, “We believe the combination of podiatrists, certified shoe fitters, and medical assistants assisting the consumer with product decisions sets us apart from any other store. Because Dr. Gonzalez and I are able to assess a patient’s foot problems and functional needs, we are in a position to anticipate when it is necessary to replace worn shoes and inserts. By employing trained medical personnel, we can make custom orthotics and shoe fitting conveniently available to our patients while working efficiently in our practice. A comprehensive shoe-fitting program will help reduce foot and ankle injuries, falls, surgeries, and possible amputations. This all leads to positive patient outcomes and satisfaction. All of the products in the store are chosen by physicians for patients. They are given knowledge about products that will increase their mobility, bring additional comfort to their lives, reduce the chance of injury, and soothe aches and pains. For additional information, visit www.myfootandanklecenter.com or call 217-787-2700 for an appointment.